I can’t believe it’s already been a year. Whew. How did time just sneak past me so quickly? Around this time last year (December 12 to be exact) C and I welcomed the 3rd member into our family, the very best Christmas gift we could have gotten. Looking back, I can’t even begin to count all the milestones, the exciting “firsts” (and equally wonderful seconds and thirds) that brought us so much joy. The year past seems to be bursting at the seams with our happiness…even in the midst of many (many!!!) sleepless nights, tired-to-the-bone days, and instances of parental insecurity and uncertainty (we’ve had our share of those too!). At this one year mark, I can’t help but look back and examine how I did as a mum so far. I’ve tried to give the best of myself, filled her bottles and bowls with what I feel are good things, protect her but also give her many opportunities for discovery and exploration. I’ve put the things I love, that I hope she learns to love, in her path – books, good food, snuggles (and more than the occasional kitchen demonstration). There are definitely things I might have done differently, in retrospect. An adjustment here and there, a little more diligent here, and little less stringent there. But on the whole, none too shabby I think…I hope. And on her first year birthday, I baked a cake. Nothing earth-shattering, but something that I believe the mum I want to be would do. In my search for this first birthday cake I looked through all my cookbooks, magazines, and bookmarked cake files. I wanted something special but simple. Nothing over the top (no 3-tier princess cakes please) but something worthy of holding that momentous single candle. As fate would have it I found that very cake on another food blog – a cake baked as a birthday cake (or future birthday cake) by a girl who was expecting her first baby (who at this writing has already celebrated that all-important 1st birthday). It was the classic of all classic birthday cakes – a yellow cake with chocolate frosting. You don’t get any more simple-but-well-loved than that. You can find the recipe HERE. If you find yourself in need of a birthday cake I implore you to give this one a try – it is perfect…moist, light and vanilla-buttery. In my pre-party test-bakes I made it both in layer cake and cupcake forms and both turned out wonderful. The recipe makes two 9-inch round, 2-inch tall cake layers, but I made two 8-inch cake layers and a dozen cupcakes instead. I used a different frosting from the one paired with the cake originally as it was not holding up too well in my warm-humid native climate. I finally settled on the recipe below which is adapted from the Cupcake Bakeshop. I love that it uses 3 kinds of chocolate that you adjust based on your taste. The recipe below uses my preferred quantities for the different chocolates, but you can find the original recipe here. – Melt the chocolate and the butter in a double boiler and stir until smooth. Set aside to cool. – Sift the powdered sugar and salt into a bowl. – Combine the milk and vanilla. – Add the milk/vanilla mixture to the sugar/salt and whisk until incorporated. – Add the melted chocolate to the milk/sugar mixture and whisk until smooth. – Chill the mixture in the fridge. When chilled whisk again until fluffy. I am so happy with the way the cake turned out, but more importantly I am so happy I actually made it. I’m sure all mothers have different (and many!) moments they mark that define themselves as mums. Baking little C’s birthday cake was definitely one of mine. To everyone else…I hope you are having a fantastic holiday season! Happy Birthday to little C and have a Merry merry Christmas and a prosperous New Year! Hi Mom-Friday! Thank you! I enjoyed baking the cake 🙂 And yes, the holiday season is now extra special for us 🙂 Hope you are having a great holidays as well! Hi TS! Thanks! Holiday greetings to you all as well! Thanks Ling! Yes, the year just sped by! Hope you had a merry Christmas! Hello Weekend Gourmet! Thank you for the nice comment 🙂 Hope you had a wonderful Christmas and best wishes for the new year! Hi Sweet tooth! Thank you! Have a wonderful holiday season! looks yummy. happy birthday to little c and happy holidays as well. just got the photos from punta fuego recently and was thinking of all of you guys. thanks for choosing to make me a part of your "simplifying" and spending all that time with me and little n when we were home. now thinking about tacos, beans and sisig pate 😛 (guess who?). What a perfectly lovely cake! I'll bet it was the best birthday ever. Until the next one. and the next one. hehe! Happy Birthday to your little one Joey! Time sure flies when you are having fun! 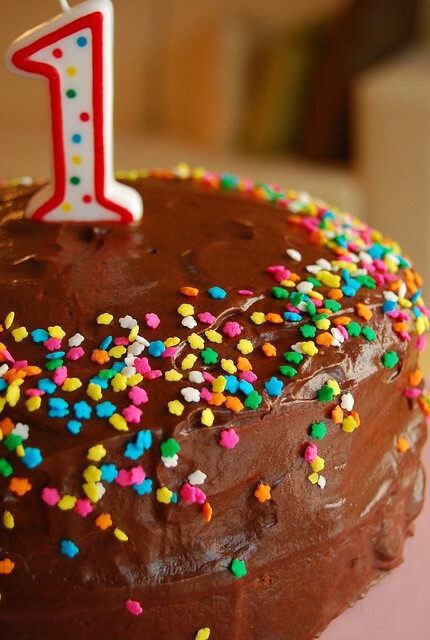 You should be very proud of what you've accomplished in the last year… and that cake… it's gorgeous. A great way to remember your daughter's first bday! awesome! congratulations, joey, and happy birthday to the cutie. it'll only get more fun from here, i assure you! Congratulations on the birthday, the cake and the most excellent photo! congratulations to your little one on her birthday (wow, time does fly away!) and wish you a your family a wonderful 2011. Hi Doods!!! Aw! How sweet of you to comment on my blog! 🙂 I wish I could have spent even more time with you and your super adorable mini-me! Glad you enjoyed and I hope to see you soon…either here or there! Big big big hug!!! Hi Trissa! Thank you! Time does indeed fly! She is running all over the place already! Hi Heidi! Happy 2011 to you too! Thank you!